Skytap provides tools to help you export your on-premises AIX LPARs to disk images that you can then import into Skytap environments. The toolset consists of a pair of scripts that you copy to an empty hard disk on the same LPAR that you want to import into Skytap. The scripts make disk images of the hard disks that you specify and then create an OVF file that contains an index of all the hard disk images. Then you use the Skytap VM Import tool to create a VM from the OVF file and disk images. Power A particular type of CPU that supports IBM i, AIX, and Linux in Skytap Cloud. VMs must enabled for your account to import AIX LPARs. x86 VM imports use a different process. For instructions about importing x86 The most common type of CPU for Windows and Linux VMs in Skytap Cloud. VMs, see Importing x86 VMs using the VM Imports page. Workloads on the LPAR should be at minimal activity. Recommended: Deactivate the volume groups to be exported, using the varyoffvg command. For details, see the varyoffvg Command reference help. The combined file size of the LPAR hard disk image files must be less than 1 TB. The export process creates full-sized disk image files(.img) for all of the hard disks that you specify. Because Skytap import for AIX VMs doesn’t support compressed files, each .img file is the full allocated size of the source hard disk—including empty space. The disk image files are created on a hard disk that you specify. Make sure you have enough space to store all of the disk image files that the Skytap tool creates. The amount of free space on the destination disk must be larger than the combined sizes of all of the disks that you will export. Though all of the hard disks that you specify will be imported, the order of the disks can vary. Prepare rootvg for export using alt_disk_copy. For details, see the alt_disk_copy Command reference help. Download the Skytap aix-export tool from GitHub: https://github.com/skytap/aix-export. The Skytap aix-export tool consists of two scripts: export_lpar.ksh and make_ovf.ksh. On the LPAR you want to import to Skytap, copy the scripts to the target disk where the disk images will be saved. Make sure the target disk has enough space to accommodate all of the hard disks that you plan to export. If there are multiple hard disks, be sure to specify the bootable hard disk first. In the example above, hdisk1 is the bootable disk. Do not include the hard disk where the export scripts are running. For example, if you copied the scripts to hdisk4, do not include hdisk4 in the export_lpar.ksh command line. Disk image (.img) files are created for all of the hard disks that you specified in the command, in the same directory where you ran export_lpar.ksh. When export_lpar.ksh completes, it automatically runs make_ovf.ksh to create <hostname>.ovf, which contains an index of the .img files that were exported by export_lpar.ksh. The combined, uncompressed file size of the LPAR hard disk image files must be less than 1 TB. If the collection of files to be imported exceeds 1 TB, contact Skytap Support at support@skytap.com to enable import of larger LPAR file sets. Create single import job for each LPAR that you want to upload. The import job will specify the .ovf and associated .img files or a single .ova (if you combined the files using tar). From the Navigation bar in Skytap, click Environments. Click the VM Imports tab. The VM Imports tab notifies you if you do not have permission to import VMs. If needed, work with your account administrator to gain access. Click (Create VM Import Job). Type an Environment Name (maximum 255 characters). For Import includes Power VMs, click Yes. Select the Region where the environment will be added. Optional: Type or paste an MD5 Hash Value. For more information, see Creating MD5 hash values for VM imports. 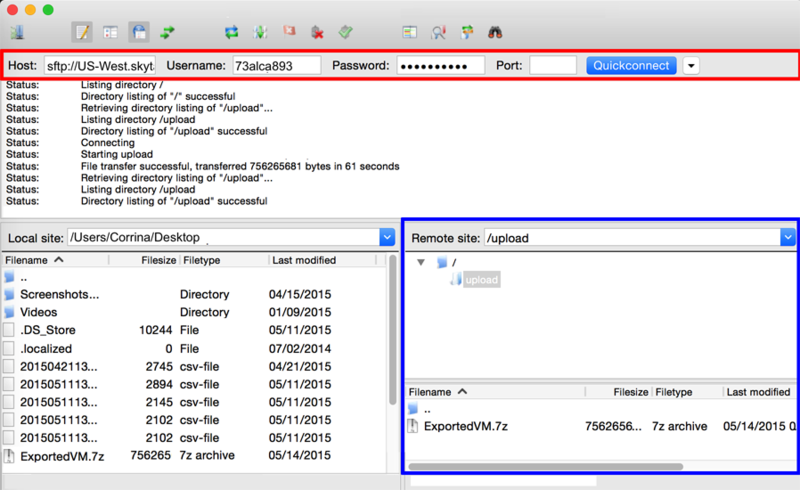 Upload the prepared VM files to the Skytap FTP server using an SFTP client (such as WinSCP). Skytap provides you with the hostname, and temporary FTP account credentials for a depot on the Skytap FTP server. Upload import files to the upload directory. If you have a choice for transfer method, choose binary transfer. Don’t put compressed files in nested directories inside the /upload directory. The temporary FTP account expires after 10 days. Though Skytap can accept transfers over FTP, SFTP is more secure and provides better protection against file corruption. 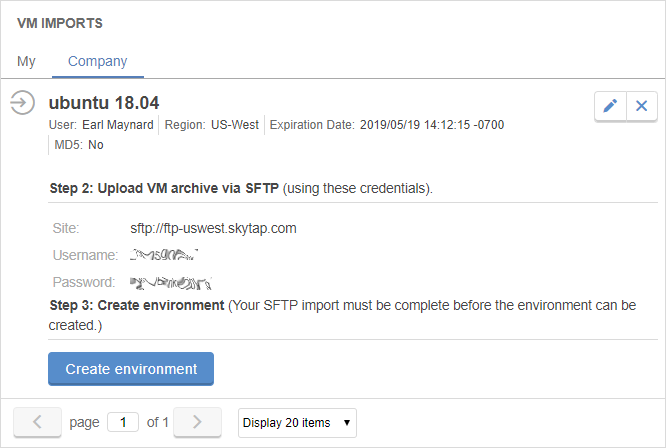 When the FTP upload is complete, click Create environment on the Skytap Import page. 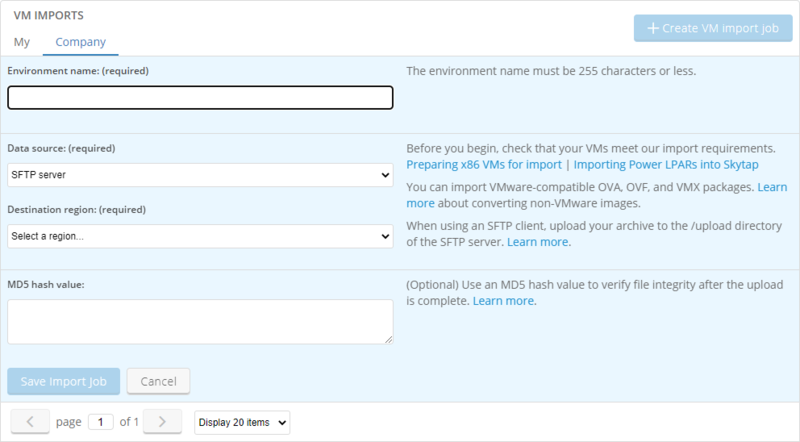 Skytap imports the VM file and create your new environment. Skytap notifies you via email when the import completes. If the import is successful, Skytap provides a link to the new environment; if the import fails, Skytap provides an error message (see Resolving import errors).